Otakon in collaboration with Aniplex of America have come together again to help raise funds for continuing tsunami relief in Japan. In exchange for a small minimum donation ($5), Otakon is offering a Limited Edition poster featuring Sword Art Online courtesy of Aniplex of America. All the proceeds for this promotion will be donated to the Japan Red Cross. 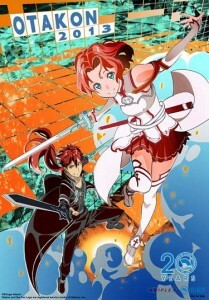 The poster featuring Sword Art Online is an original design by Otakon guest Shingo Adachi and features Otakon mascots Hiroko and Hiroshi cosplaying as the characters from SAO. This poster will only be available at Otakon 2013. Donations for posters will be available at the Otakon merchandise table in the Dealers Room while supplies last but donations will are gladly accepted at any time. Limit one poster per donation and one poster per person. Originally airing in Japan from July through December, 2012, Sword Art Online is an original story by Reki Kawahara developed into TV series directed by Tomohiko Ito (Silver Spoon) and produced by A-1 Pictures. 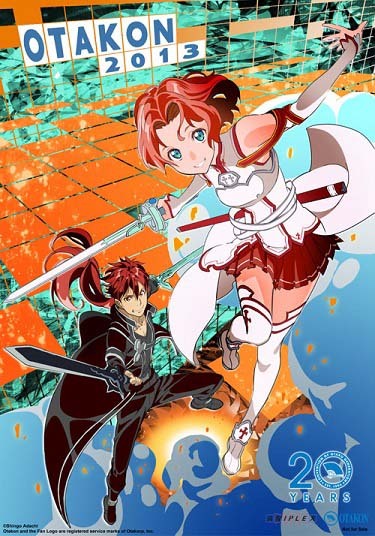 With the popularity of the series growing worldwide, Aniplex of America has recently announced plans of releasing the series to the US audience with the first Blu-Ray and DVD sets to be released August 13, 2013. Also, Sword Art Online will be featured on Toonami starting on July 27, 2013. For more information about this title please visit www.swordart-onlineusa.com. There will be an “Art of Sword Art Online” panel happening on Saturday of the Otakon convention featuring Shingo Adachi and Tetsuya Kawakami.